A sea lion rescued from the middle of a road several streets away from the sea has been returned to the ocean after nearly two weeks of rehabilitative care at SeaWorld San Diego’s Animal Health and Rescue Center. SeaWorld received calls at the end of October to its Rescue Hotline that “there was a sea lion in the street”. Once on site, the Rescue Team found an adult female sea lion lying in the middle of the street. The sea lion, who was named Rose, was brought to the park’s Rescue Center for examination and rehabilitative care. Rose was in good body condition and weight (approximately 175 pounds) when rescued and responded well to treatment at the park. Following several days of observation, it was determined that Rose was ready to be returned to the ocean. She was returned with three other rescued sea lions several miles off the coast of San Diego. While it was somewhat unusual to find Rose several streets from the water and on a public road, SeaWorld has made a number of rescues in the past from out of the ordinary places including the driveways and porches of peoples’ homes, outdoor eating areas at hotels, car parks, and, in 2016, from inside a San Diego-area restaurant. 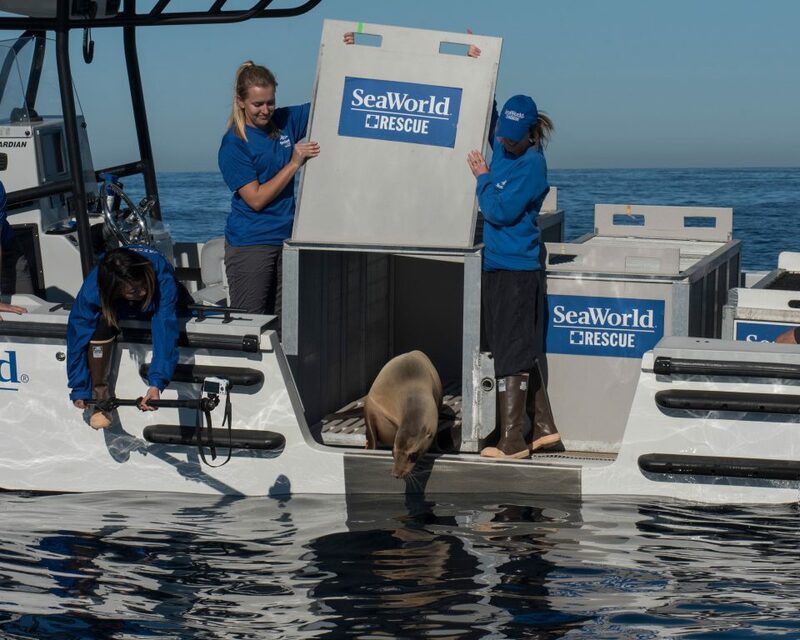 The goal of SeaWorld’s Animal Rescue and Rehabilitation Program is to return rescued, nursed-back-to-health animals to the wild for a second chance at life. Nearly 70 percent of the marine mammals rescued by the park are returned to the wild. So far in 2018, SeaWorld has come to the aid of more than 900 ill, injured and stranded marine animals including sea lions, seals, sea turtles and birds.